WHAT WOULD YOU LIKE TO DO ON YOUR FIRST VISIT? The most common type of indoor climbing with a partner. You climb as your belay partner manages the rope, which is suspended from above. Belay certification is required. Climbing shorter walls without a harness or rope. This is the only type of indoor climbing that does not require a partner or belay certification. Lead climbing is usually appropriate for more experienced climbers. As you climb you clip your rope into anchors. Advanced belay certification and a rope is required. Top rope climbing is the most common type of indoor climbing with a partner. The climber’s harness is secured to a rope, which their partner manages. All of Mesa Rim’s guests must complete a waiver. Save time by signing your waiver online before your first visit. Parents (or court appointed guardians) must sign the waiver for children under 18 years old. Belaying is the practice of managing the climbing rope, to protect your partner from falls. Before your first climb on the tall walls, you will need to take a lesson on belaying technique and safety. After this class you’ll be certified to climb and belay for the day. Classes can get full, so we recommend reserving your lesson in advance. On your first visit, the front desk team will help you purchase a membership or pass. If you don’t have climbing gear, you can also rent everything you’ll need to get started. We recommend arriving at least 15 minutes before your belay lesson. Bouldering is climbing shorter walls, without the use of a harness or rope. This is the only type of climbing which does not require a partner. On your first visit, the front desk team will help you purchase a membership or pass. If you don’t have climbing gear, you can also rent everything you’ll need to get started. Lead climbing is generally done by more experienced climbers. The climber clips their rope into anchors as they climb, with the belayer feeding them rope from below. Lead climbers and belayers must have the standard belay certification, as well as a lead certification. See the front desk to arrange these tests. 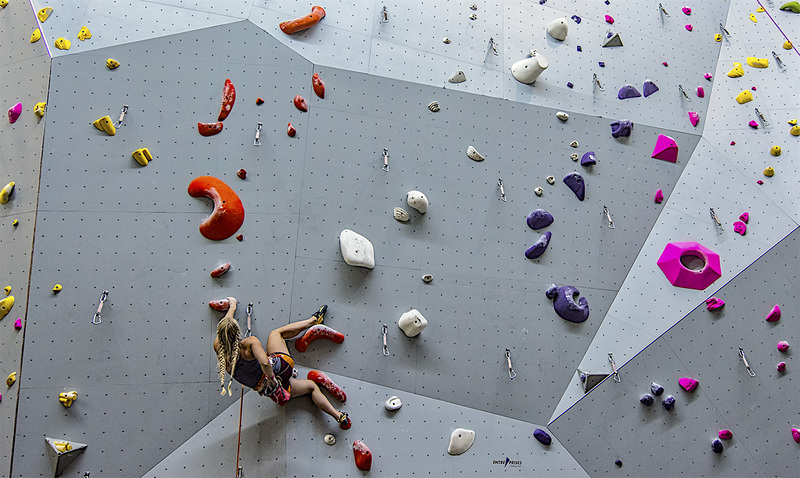 We recommend that even experienced climbers take belay and lead climbing classes, since certification at other gyms does not necessarily prepare you to pass Mesa Rim’s tests. You will need to provide your own rope for lead climbing. We do not rent ropes, but they are available for purchase in the Pro Shop. Take a look at our group training classes and find one that works for you. We provide everything you’ll need to attend a yoga class, including: mats, blocks and straps. Take a look at our yoga schedule and find a class that works for you. On your first visit, the front desk team will help you purchase a membership or pass. Take a look at our youth programs schedule and select a program. The first step in private instruction is to send us a message and tell us about your training goals. We will follow up with you to schedule an appointment.